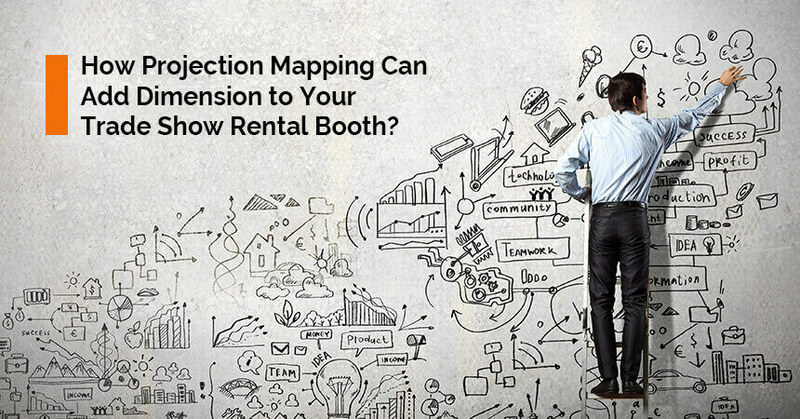 How Projection Mapping Can Add Dimension to Your Trade Show Rental Booth? Striking a conversation with visitors, as they flow in and out of different trade show rental booths at a marketing event is a two-fold challenge. First, sales persons representing the exhibitor brand deal with a crowd and it is hard to identify which of the visitors may be the right prospects to talk to. Second, visitors on their part are faced with an army of similar looking trade show rental booths with neon glow boards and brand content welcoming them, thereby augmenting their confusion. Brand messaging and communication become enormously challenging propositions under such circumstances. It is in this context that modern-day brand exhibitors need to seek innovation to streamline their brand communication strategy and give visitors not just a product or a service but an experience that shall stay with them long after the trade show is over. Projection mapping is the new age brand communication technology available to brand exhibiting at trade shows that transforms brand content communication into a user experience. Projection mapping, also known as spatial augmented reality or video mapping is a visual display technique that maps projected images on any surface such as a building exterior, an object, a landscape or an interior wall, thereby transforming it into a video screen. When deployed in the trade show booth, the effect of projection mapping is to deliver a 3D visual experience by projecting images and videos on the surface in the absence of ambient light and all-glass surfaces, such that the viewer is struck with a sense of hallucination. While 3D experience brings the delivery of brand content to life, the after effects count and add value. The deployment of projection mapping creates an unparalleled learning experience because of the value and rareness quotient in-built in the technology, such that viewers continue to retain the brand content in their memories long after the trade show or projection is over. There is credible evidence available now that confirms the effectiveness of projection mapping in strengthening human memory in a way that conventional brand content fails to achieve. First, projection mapping actually offers an immersive experience to visitors at trade shows because with the unique projection of image and video content on any surface and the 3D visual effect it generates, visitors are able to overcome the multitude of “noise” in the background and thus be “mindful” of the brand content only. Second, beyond doubt, the deployment of projection mapping multiplies the traffic and number of gross impressions generated by the trade show rental booth by enabling exhibitors to grab the attention of visitors even without saying a word. Third, it allows brand exhibitors to economize the usage of the floor area and the rest of the built environment. Presuming that an interior wall of the trade show exhibits rental booth is earmarked and engineered to integrate projection mapping technology, it allows ample free space for visitors to congregate and watch a 3D brand video content simultaneously, thus scaling up the speed, flow and impact of the brand communication process. Fourth, given the rareness and enormous value that visitors attach to the end user experience, it is a given that the use of projection mapping is the most sure shot way to beat the competition and drive traffic into the trade show booth. This multiplies the scope of generating qualified leads. Fifth, in the digital era visitors that have experienced projection mapping, are highly likely to share their experience and exposure to this refreshing new form of accessing brand content and thus share stories on social media instantly. This augurs really well for the post-production impression of the event for the brand exhibitors. There is absolutely no doubt that the use of projection mapping can create great value for business and scale up the returns on investment in trade show marketing. However there are factors for the marketing executives of exhibitor brands to consider. Renting a projector can cost anywhere in the range of USD 150,000 to 400,000. Again costs may vary locally among vendors, but given that the technology is new, disruptive and a game-changer at trade shows, marketing executives need to evaluate their budget well. Other costs to be assessed include the trade show location costs, permit costs, the costs of video content production and crew costs. Second, integrating a projection mapping technology with a trade show booth design ideas calls for a turnaround time of 8 to 12 weeks. This includes the visualization of the trade show booth design, floor plan allotted, choice of materials for the surface to be used for projection of content and appropriate lighting to go with. Third, it is necessary to assess the frequency of running the projection mapped show during the course of the trade show and schedule shows with intermittent time to strike conversations, answer questions that visitors may have and distribute associated marketing literature and accessories. As such it is recommended that a projection mapped show be run 5 to 8 times over a 10-hour period. Fourth, there are safety laws and statutes governing the deployment of projection mapping technology at trade show venues and public spaces in the United States. It is advised that the brand exhibitor seek clarity on the local permits and clearances required and proceed with a no-objection certificate, up from the ground running to comply with layout and floor planning visitor safety at the premises. Fifth, there are specific industry verticals that stand to derive the greatest value from the deployment of projection mapping at trade shows. These are: real estate, automobile, interior designing, architecture, motor sports, heavy engineering, entertainment and gaming. To state that brand communication is the key challenge at trade shows shall be an understatement. New age disruptive technologies like projection mapping lend a unique aura to the delivery of brand content and thus augment visitor memory, expedite learning and redefine visitor experiences for referrals and recommendations among business communities and professional networks.